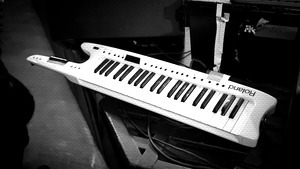 KitMonsters – Roland AX-7. The music makers’ guide to making music. 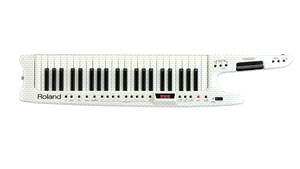 The AX-7 MIDI Keyboard Controller builds on the legendary AX-1 and has extra features including new controllers such as D-Beam, and also a new LED display to make it easy to use. It has an expanded patch memory - 128 with data backup via MIDI - and GM2/gs compatibility. The AX-7 has a 45-note velocity-sensitive keyboard and five realtime controllers: Data Entry knob, Touch Controller, Expression Bar, Hold button and D-Beam which allows you to control everything from chord memory to arpeggios and expression data via an infrared beam of light. The AX-7 also has 2 MIDI zones for independent control of Upper/Lower parts.